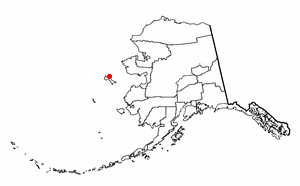 The United States Census Bureau defines St. Lawrence Island as Block Group 6, Census Tract 1 of Nome Census Area, Alaska. As of the 2000 census there were 1,292 people living on a land area of 1,791.56 sq mi (4,640.1 km2). 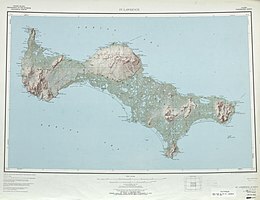 The island is about 90 miles (140 km) long and 8–22 miles (13–36 km) wide. The island has no trees, and the only woody plants are Arctic willow, standing no more than a foot (30 cm) high. The island's abundance of seabirds and marine mammals is due largely to the influence of the Anadyr Current, an ocean current which brings cold, nutrient-rich water from the deep waters of the Bering Sea shelf edge. To the south of the island there was a persistent polynya in 1999, formed when the prevailing winds from the north and east blow the migrating ice away from the coast. The island contains two villages: Savoonga and Gambell. The two villages were given title to most of the land on St. Lawrence Island by the Alaska Native Claims Settlement Act in 1971. As a result of having title to the land, the Yupik are legally able to sell the fossilized ivory and other artifacts found on St. Lawrence Island. The island is now inhabited mostly by Siberian Yupik engaged in hunting, fishing, and reindeer herding. The St. Lawrence Island Yupik people are also known for their skill in carving, mostly with materials from marine mammals (walrus ivory and whale bone). The Arctic yo-yo may have evolved on the island. St. Lawrence Island was first occupied around 2,000 to 2,500 years ago by coastal people characterized by artifacts decorated in the Okvik (oogfik) style. Archaeological sites on the Punuk Islands, off the eastern end of St. Lawrence Island, at Kukulik, near Savoonga and on the hill slopes above Gambell have evidence of the Okivik occupation. The Okvik decorative style is zoomorphic and elaborate, executed in a sometimes crude engraving technique, with greater variation than the Old Bering Sea and Punuk styles. The Okivik occupation is influenced by and may have been coincident with the Old Bering Sea occupation of 2000 years ago to around 700 years ago, characterized by the simpler and more homogeneous Punuk style. Stone artifacts changed from chipped stone to ground slate; carved ivory harpoon heads are smaller and simpler in design. Prehistoric and early historic occupations of St. Lawrence Island were never permanent, with periods of abandonment and reoccupation depending on resource availability and changes in weather patterns. Famine was common, as evidenced by Harris lines and enamel hypoplasia in human skeletons. Travel to and from the mainland was common during calm weather, so the island was used as a hunting base, and occupation sites were re-used periodically rather than permanently occupied. Major archaeology sites at Gambell and Savoonga (Kukulik) were excavated by Otto Geist and Ivar Skarland of the University of Alaska Fairbanks. Collections from these excavations are curated at the University of Alaska Museum on the UAF campus. The island was called Sivuqaq by the Yupik who lived there. It was visited by Russian/Danish explorer Vitus Bering on St. Lawrence's Day, August 10, 1728, and named after the day of his visit. The island was the first place in Alaska known to have been visited by European explorers. There were about 4,000 Central Alaskan Yupik and Siberian Yupik living in several villages on the island in the mid-19th century. They subsisted by hunting walrus and whale and by fishing. A famine in 1878–1880 caused many to starve and many others to leave, decimating the island's population. A revenue cutter visited the island in 1880 and estimated that out of 700 inhabitants, 500 were found dead of starvation. Reports of the day put the blame on traders' supplying the people with liquor causing the people to ″neglect laying up their usual supply of provisions″. Nearly all the residents remaining were Siberian Yupik. Reindeer were introduced on the island in 1900 in an attempt to bolster the economy. The reindeer herd grew to about 10,000 animals by 1917, but has since declined. Reindeer are herded as a source of subsistence meat to this day. In 1903 President Theodore Roosevelt established a reindeer reservation on the island. This caused legal issues in the indigenous land claim process to acquire surface and subsurface rights to their land, under the section 19 of Alaska Native Claims Settlement Act (ANCSA) as they had to prove that the reindeer reserve was set up to support the indigenous people rather than to protect the reindeer themselves. During World War II, islanders served in the Alaska Territorial Guard (ATG). Following disbandment of the ATG in 1947, and with the construction of Northeast Cape Air Force Station in 1952, many islanders joined the Alaska National Guard to provide for the defense of the island and station. There was an exchange of shots after a Soviet fighter advised the US plane that it was over Soviet territory and should leave (the US denied that the US plane fired at all). The incident took place under heavy cloud cover and poor visibility, although the alleged violation of Soviet airspace could be the responsibility of US commanders not interested in preventing such violations. The Soviet military was under strict orders to "avoid any action beyond the limits of the Soviet state frontiers." The Soviet government "expressed regret in regard to the incident," and, "taking into account... conditions which do not exclude the possibility of a mistake from one side or the other," was willing to compensate the US for 50% of damages sustained—the first such offer ever made by the Soviets for any Cold War shoot-down incident. The US government stated that it was satisfied with the Soviet expression of regret and the offer of partial compensation, although it said that the Soviet statement also fell short of what the available information indicated. Northeast Cape Air Force Station, at the island's other end, was a United States Air Force facility consisting of an Aircraft Control and Warning (AC&W) radar site, a United States Air Force Security Service listening post; and a White Alice Communications System (WACS) site that operated from about 1952 to about 1972. The area surrounding the Northeast Cape base site had been a traditional camp site for several Yupik families for centuries. After the base closed down in the 1970s, many of these people started to experience health problems. Even today, people who grew up at Northeast Cape have high rates of cancer and other diseases, possibly due to PCB exposure around the site. 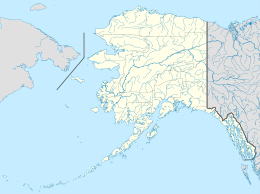 According to the State of Alaska, those elevated cancer rates have been shown to be comparable to the rates of other Alaskan and non-Alaskan arctic natives who were not exposed to a similar Air Force facility. In any event, the majority of the facility was removed in a $10.5 million cleanup program in 2003. Monitoring of the site will continue into the future. The airports are Gambell Airport and Savoonga Airport. ^ "Tools and Implements: St. Lawrence Island and the Bering Strait Region". University of Missouri-Columbia Museum of Anthropology. Retrieved 2006-05-24. ^ "St Lawrence Polynya". Polar Research at UW Oceanography. Retrieved 2006-06-12. ^ "Archeology of the Tundra and Arctic Alaska". nps.gov. Retrieved 16 November 2010. ^ "A Starving Population". The Cornishman (122). 11 November 1880. p. 3. ^ "VP-9 Mishap". June 22, 1955: US Navy Aircraft Attacked Over Bering Sea. U. S. Navy Patrol Squadrons. 24 Jan 2011. Retrieved April 7, 2011. ^ "Aircraft Control And Warning System". DoD. About.com. Retrieved April 7, 2011. A system established to control and report the movement of aircraft. It consists of observation facilities (radar, passive electronic, visual, or other means), control center, and necessary communications. ^ Coming Clean network. "PCB's in People of St. Lawrence Island". Body Burden Report. Retrieved 2006-06-12. ^ State of Alaska Epidemiology Bulletin. PCB Blood Test Results from St. Lawrence Island. February 6, 2003. ^ State of Alaska Department of Environmental Conservation. "St. Lawrence Island". Contaminated Sites Program. Retrieved 2006-06-12. Government of Alaska (2018). "History". Government of Alaska. Retrieved December 16, 2018. Wikimedia Commons has media related to Saint Lawrence Island.